Those who visit our news section frequently may be a little confused about the title of this post. But fear not, REO UK hasn't turned into a children's publishing house. Our Tichelmann is not an orange blob with wobbly arms, but rather a system that applies to the heating, ventilation and air conditioning markets. 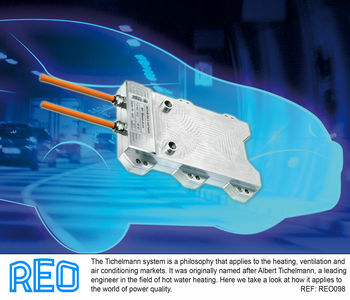 Originally named after Albert Tichelmann, leading engineer in the field of hot water heating, the Tichelmann philosophy can be applied to the power sector as well. The Tichelmann model normally refers to a two-string system, in which each radiator on the same floor has the same total distribution pipe length. These kinds of applications are also commonly referred to as reverse return systems. This means that radiators with a short length of supply pipe measured from the pump, have a correspondingly longer return pipe. The opposite applies to the radiator located furthest away. This ensures that the same resistance is achieved throughout the system and that the radiator returns equal water flow-rate in all heating surfaces. As a result, the water flow for each heating source doesn’t need to be individually adjusted during commissioning. When it comes to the power quality products REO manufactures, the Tichelmann principle is used to describe the method of connecting power elements in a distribution network. When multiple elements are used within the system of a water cooled resistor, the water in-feeds connected to the individual pipes must be at the same temperature, pressure and flow rate. Otherwise, we'd have significant imbalances occurring between elements. Sooner or later, this would make the entire application fail. To overcome this challenge, REO applies the Tichelmann principle by connecting each water cooled element to a separate water feed and return. The relative lengths for the combined feed and return are the same for each part. This reduces the number of problems that can occur because of the high pressure water flow rates. When supplying a resistor, all of these points are factored in at the design stage. Computer modelling software is used to ensure that there are no functional flaws that could endanger the user or the application.